In the Gospel of John Jesus directs us, "Abide in me, as I abide in you." This book is an invitation to make the Word of God your home through the practice of lectio divina. Macrina Wiederkehr, OSB, encourages you to turn the words of Scripture over in your heart as a plow turns over the soil to welcome the seed. Macrina Wiederkehr, OSB, author of the popular A Tree Full of Angels (HarperCollins) and Seven Sacred Pauses (Ave Maria), is well known for her creative spiritual writings and retreat ministry. She is also a regular columnist for Stepping Stones, the Little Rock Scripture Study newsletter. She has lived monastic life for fifty years and makes her home with the Sisters of St. Scholastica, a Benedictine monastery in Fort Smith, Arkansas. Writing and retreat ministry have become a part of her evolving call. Visit her personal blog at http://macrina-underthesycamoretree.blogspot.com/. This rich trove of reflections on the Scriptures is the fruit of Macrina Wiederkehr's many years of faithful attentiveness to the Word. 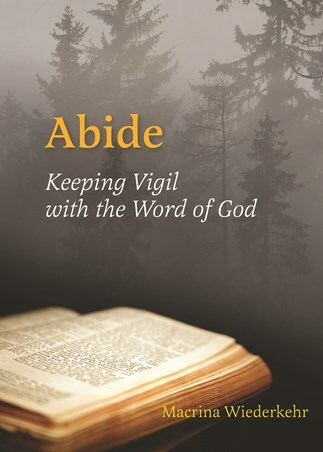 In Abide, readers are invited to allow themselves to be formed by the Word through the practice of lectio divina, using five steps: wait, read, listen obediently, pray, and abide. Wiederkehr's insights into the biblical text and well-formed questions aid readers to deepen in their ability to be led by the Spirit into abiding presence with the Word of God, encountered both in the Scriptures, and in every person. Our reading and study of the Bible must move into personal reflection and contemplative prayer if we desire Scripture to do its transforming work within us. Macrina Wiederkehr shows us how to let God's Word make its home in our hearts and become an instrument of our healing, encouragement, and hope. This inspiring work offers us the fruit of her lifelong romance with the Word of God so that the Word may also become our heart's greatest desire. Abide is an inspiring and imaginative collection of meditations, questions, and reflections on the Word of God. Our quest for the Holy One is a daily one which is played out in our ordinary lives and not in some magnificent cathedral. . . . Wiederkehr opens fresh ways of perceiving tradition: for example, each time we prayerfully walk through a Scriptural passage, we are on our own private pilgrimage. Each time we sit down at `the altar of our own lives to evaluate our growth in Christ,' we are on a pilgrimage. Whether you are a pro at lectio divina or are still struggling to understand the practice, this book will inspire you. It doesn't take long to recognize that this is a book in which every page has been born of prayer. Page by page, word by word, Macrina Wiederkehr fashions a guesthouse for the reader fortunate enough to cross the threshold. Here is a place of hospitality where she invites us in and keeps vigil with us, inspiring us in turn to become, in our own lives, a place of welcome for the Word. With her rich imagery, poetic sensibility, reverence for language, and practical wisdom, Macrina reawakens us to the lively power of the scriptures, and reminds us of their purpose: to be a place of meeting where we encounter the living God. Sister Macrina invites us to enter into the biblical Word of God as if coming into the warm shadows of a sanctuary to spend time with God "in the silent cathedral of our beings." She makes us conscious of a living presence as she opens selected passages with beautifully written meditations, sharing her own daily journey of faith. With her help we learn to slow down and listen, waiting patiently and confidently for the Lord to speak to our hearts.